Central is in heart of the city & and the city’s urban growth centre. On what basis do you decide to close a school? That was the task given to the Burlington Program & Accommodation Review Committee (PARC) of 14 parents. We had 13 criteria to assess school closure options to eliminate 1800 empty pupil spaces across seven high schools in Burlington. As one of two parent representatives on the PARC for Burlington Central High School, I came into this process with a commitment to do what is best for all our students, and go where the evidence takes us. I entered the discussion with an open mind – but not an empty mind. Knowing the community as I do, it made no sense to me to close Central – the director’s initial recommendation along with closing Pearson. The more we have learned through months of discussion and mountains of data, the less sense it makes to close Central. There are five options left on the table. 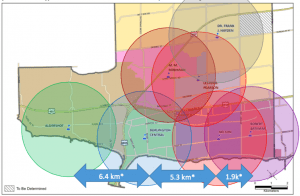 One option to close Central & Pearson – 19b – was dropped because it is too similar to option 28c. Of the remaining options, which include closing Central & Pearson, closing Bateman, closing Bateman & Pearson, and closing Nelson, where does the evidence point? The evidence only suggests that there are some options that are worse than others, and none that are great. There will be community disruption no matter what the board does, including closing no schools. At minimum, boundary changes will be required to address overenrolment at Hayden and underenrolment at MMRobinson, Pearson and Bateman. 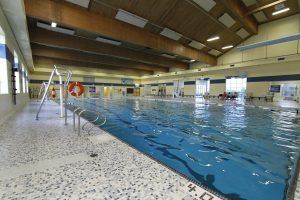 There is growing support in the community and around the PARC table for a no schools close option, supplemented with boundary changes, community use of schools, cooperation with the Catholic board, and innovative programming to increase the student body, through such ideas as creating regional programs (for example, a cabinet making program in Burlington; the closest is in Georgetown; or an arts program so Burlington students don’t need to go to Etobicoke School of the Arts). Those are some of the ideas being discussed at the final PARC meetings, which are set to wrap up March 27. Below is a snapshot of some of the criteria across all of the schools, showing just how difficult the school closure decision is – as it should be. One of two reasons the PAR began was to address programming conflicts and challenges, largely assumed to be driven by low enrolment. So do you close the school with the highest course conflict rate? Data on timetable conflicts provided to the PARC found Lester B Pearson has the highest at 44%, followed by Aldershot at 38%, Central at 32%, MM Robinson at 25%, Bateman at 21%, Nelson at 18% and Hayden at 11%. However, boundary changes directing students from Pearson to the now-overflowing Hayden have led to low enrolment at Pearson. Redirecting students back to Pearson would address two issues: Hayden overcrowding and Pearson under-enrolment. The next highest school with course conflicts is Aldershot – not even on the closure list (and shouldn’t be). Let’s turn to low enrolment below 65% of capacity – the other reason the PAR was called. Do you close the emptiest school? That would be MM Robinson – also not one of the closure options. 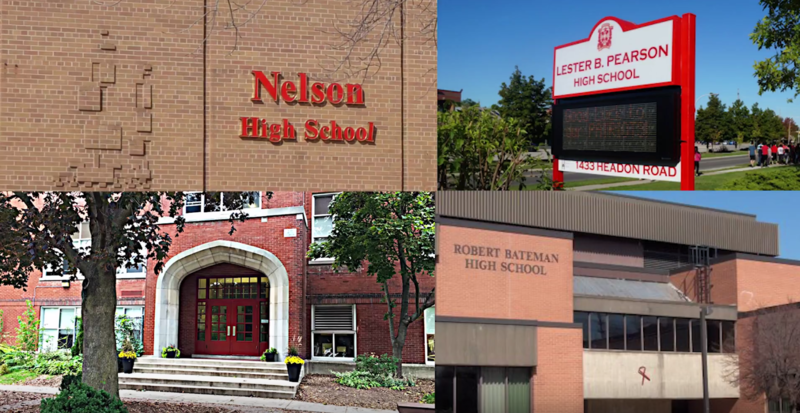 According to 2016-2017 projections MM Robinson’s utlization rate is 50%, followed by Bateman at 56%, Pearson at 59%, Central at 68%, Nelson at 79% and Aldershot at 83%. Hayden is overcapacity, at 139%, but again this could be addressed by directing students to the three lowest enrolment schools: MM Robinson, Pearson (both North of the QEW like Hayden) or Bateman (South of Hayden, South of the QEW). Further, a PARC member has done a detailed analysis of school size and enrolment and found that while generally the fewer students the more potential for course conflicts, there is no statistical correlation between the two. Presently Burlington as a whole has a course conflict rate of 23%, which would minimally drop to 18.7 % with a one school closure or 15.6% with a two school closure. It doesn’t make sense to close one or more schools and push enrolment over 100% at some schools for such a small (almost negligible) improvement in course selection for students. One of the criteria is “fiscal responsibility.” So let’s look at costs, namely the five year projected renewal needs, annual operating costs and costs for compliance with accessibility legislation. Should you close the most expensive school to renew? That would be Bateman (see chart below). However, the data we received has been roundly criticized by the PARC and public for several reasons. 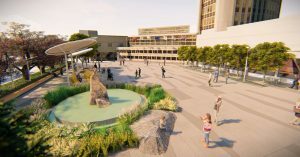 The renewal costs have changed dramatically over several months, by a factor of $23m between the release of the first set of costs in December and the latest version in January. For Central (and possibly other schools) some of the costs included work already completed – to the tune of more than $1 million. Finally, the time horizons for each school vary from six years to 19 years – like comparing apples and oranges. The data is so suspect the PARC has been advised not to focus on costs. Additionally, all schools are required to come into compliance with Accessibility for Ontarians with Disabilities Act (AODA) legislation by 2025, meaning elevators, accessible doors, ramps, and other features. Those costs are below for each school, however they do not include the cost for a recommended upgrade in elevators for Aldershot, Pearson and Nelson from their current LULA (Limited Use, Limited Access) elevator, or a required new elevator at MM Robinson. In addition, Central’s AODA costs contain a higher percentage of overall costs than other schools for asbestos abatement during construction – however, most of the the school was built in 1922, before asbestos was used. AODA are one-time expenses required under legislation for all schools, and can be phased in over the next seven years. To put these costs in perspective, the cost to bring Central into compliance phased in over seven years is $457k per year. That’s not much more than the $378k annual cost to bus an additional 600 students (at $630 per student) if Central & Pearson were closed (see busing chart below). Plus, busing costs continue in perpetuity every year, whereas AODA are one time expenses. In addition, closing Central & Pearson will lead to overcrowding at Aldershot (capacity jumps to 129% in 2018), Aldershot can accommodate 10 portables, at $60,000 each in installation (plus annual operating), for a total of $600,000. Thus, any “savings” from closing Central to avoid AODA costs will vanish within about five years, leaving only ongoing busing and portable costs. 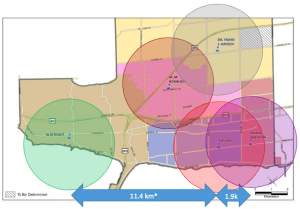 One of the 13 criteria is “proximity to other schools (non-bus distances, natural boundaries, walking routes).” Student groups and programs can move to different schools, but nothing changes geography. So, do you close a school in close proximity to another school? In the south that would be either Nelson or Bateman, 1.9km apart. This close proximity to each other is one of the reasons PARC members added Bateman and Nelson to the closure list. In the North, that would be Pearson, whose catchment overlaps with MM Robinson and Hayden. However, Pearson could take some of the overflow from Hayden if it remained open. The map provides the walking distance for each school, shown by the circles. 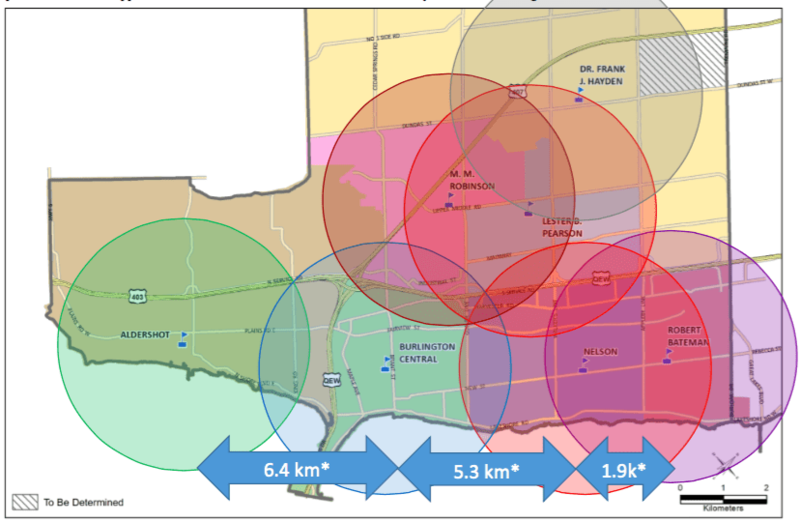 The director’s initial recommendation to close Central & Pearson would create an 11.4km hole in the heart of the city with no school, in an intensification area with the highest growth targets of the whole city. A school where 93% of kids live within walking distance would turn into a school where 100% of kids are bused outside the neighbourhood. This is not a one-time transition. Closing Central would permanently remove the only school from a thriving community and bus kids out of their neighbourhood. The principle here is that you put schools where students are, and you keep schools where students live. That the same rationale must apply today to keeping Central open. There is significant variation among the options in terms of the number of kids who will have to change schools, as well as the number of “split cohorts” meaning Grade 6, or Grade 7-8 classes will go to different high schools, separating friends who’ve gone to school together since kindergarten. 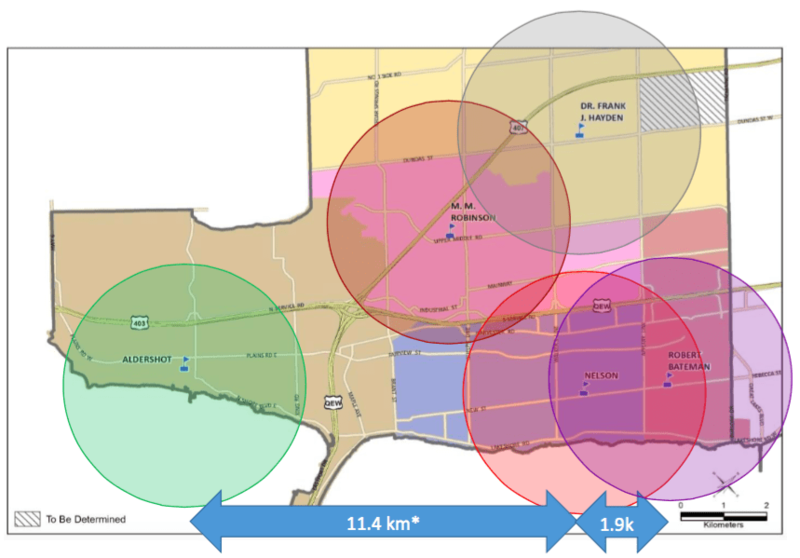 Based on the above analysis, the most disruptive option to students of the five is closing Central/Pearson, with close to 2000 students uprooted and changing schools, not counting the impact on elementary students from split cohorts (kids from an elementary school going to different high schools) and elementary schools redirected from their current high school to another high school. Several of the options swing from undercapacity to overcapacity at some schools, putting students in portables, the very thing that we are trying to correct at Hayden. One of the criteria for the PAR to consider in evaluating options is the “goals and focus of the current multi-year plan”. The school utilization goal of the plan is 90%. When schools drop below 65%, a Program & Accommodation Review can be called. In the options below, where there is overcapacity at some schools and also undercapacity (below 65%) at others, further boundary changes could address both under and over capacity. I have waited until the PARC completed its work to correct some of the misdirection. You cannot compare schools based on OTG percentages because, for example, MM Robinson is the highest capacity high school in Burlington so having MMR at 55% will have more students than another school at 80% due to the number of students in the school. As the PARC was advised, you cannot compare costs from school to school in terms of facility costs. The costs are for each school to reach the point of when they were first built then plus the AODA for that individual school. Any costs over and above that are to bring the school in line with newer schools. The HDSB is doing this through “Closing the Gap” funding. When you hear someone say that a school doesn’t have an elevator because the board didn’t give them one, look to the principal and ask what they have put on the list as important upgrades and renewal costs to their school. This is something that every principal controls through an online process. As well, when looking at cost to run a school you also need to look at the size of the school and the specialized programs they provide. For example, the trades programs at Bateman and MMR not to mention the size of the schools. Oh, by the way, the cabinet making program is a Specialist High Skills Major that is also offered at MMR. Information was provided on how many students a “magnet” school would bring in to the board and they are very few. This information was provided through data from the Rainbow School Board, Peel School of the Arts and Hamilton’s Self-Paced School. Ideas such as self-paced learning, e-learning, blended learning along with a great variety of Specialist High Skills Majors within the HDSB are already being done. Did you know that the HDSB is the only school board in the province with Specialist High Skills Major type certificates for students who will not graduate with a diploma? They are the Employability Skills Certificate and the Community Skills Certificate to which the HDSB not only won a City of Burlington Accessibility Award for but has the Ministry of Education watching to use it as provincial model. These programs are only done in the self-contained placements; two of which are MMR and Bateman. Far too much time was spent on numbers rather than students and how they access the programming. With 1800 empty pupil places in Burlington, programming is affected. Schools are funded by pupil and therefore only a certain number of “sections” (classes) are funded. Therefore, you have students HAVING to take online courses, summer school, etc. even if they can’t learn that way. Why should every other student in the board have the ability to access programming the way they need to (like in class) rather than the way they have to. It affects their marks and their future endeavours. The 1800 empty spots also affect the number of classes that are offered; especially come Grades 11 & 12 when students are wanting to start taking classes that will help them with specializing in the area they want to continue in. Last question: with the HDSB being the lowest funded school board in the province and having to reduce funding in so many areas of their budget last year; including $2 million in special education last year and another $2 million in special education this year, where does Burlington expect to get the money to pay for the empty spaces in order to provide equity of access to programming? Is the expectation that every other area in the board have more than Burlington just to keep schools open? But why these programs only in two schools…. they should be in all schools. All high schools have shop/auto, also the schools have nothing todo with how a child does. It’s the teaching and what they are willing to learn.. their isn’t failing something any more everyone is passed and treated with a gold star format. This entire review process is so flawed. The funding formula is the core of the problem. Then add the multiple school boards that reflect tens of millions, if not hundreds of millions of dollars wasted on “segregated” schools and duplicated administration, etc. etc. Before we close schools and destroy neighbourhoods, the school boards need to get more aggressive with Queen’s Park and the Ministry of Education – demanding a change in funding formula and make this an election issue. Most voters pay little or no attention to the trustees they elect if they do at all. Very few people have any idea how the boards are managed, etc. And yet, the future of everyone’s children is at stake. The loss of OAC (to save money, not because it was not needed or successful) and the new curriculum already has damaged a generation. We are still living with much of the Mike Harris’ horrid education system changes. When the double cohort entered post-secondary, the differences were so blatant to me while teaching at University of Western Ontario – in their knowledge, expectations, and focus on “memorizing” not understanding what they’re learning. Not to blanket all students, but the system is failing too many. Katie, the self-contained placements are only at MMR and Bateman because they serve a smaller number of students that require a larger amount of space. The shop/auto is available to some extent in schools; however, there are Specialist High Skills Majors that are only in some of the schools that highlight all the classes and co-ops that support the trades. In terms of the teaching, you need to have the ability for students to learn in a format that suits their individual learning style. In every area of the Board, except Burlington, students are able to access the classes in whichever format suits them. I want that for my kids in Burlington too. You close schools you kids aren’t going to have the same teaching experience… their class sizes are going to be bigger what they are now… in some schools situations do you want your kid to be in a portable for her /his high school years. TBH skills majors should be offered at all schools. Jeffrey C. Martin when the funding formula came into place provincially many moons ago, it was where all of our tax monies went to the province and then school boards get grants back in various areas. They did the funding this way in order to ensure that the smaller school boards received the same level of funding as other school boards. For example, in Burlington much of our tax dollars go to other school boards. In terms of duplication and segregation it would be an inequity of access to have two locations in every other area of the board; except Burlington with 2 locations for students with high needs. We talk about neighbourhoods; well, the students in the north are thankful that their student can go to MMR for the self-contained placement and the same with the south for Bateman. When you consider the transition issues which are covered under PPM156 from the Ontario Ministry of Education and PPM140 for students with Autism, these are huge issues affecting the students at these two schools. To segregate them and put them all in one place is contrary to the Ontario Human Rights Code wherein it speaks to respect and dignity for those with disabilities. Katie McGrath I’m sorry what is a TBH? In terms of closing schools and teaching experience….once again it isn’t about the class itself, it’s about access to the number of classes and how you can take them. By the way, I think if you review the options, there is no option that has portables except perhaps 23d? Also, if you are meaning SHSMs (Specialist High Skills Majors) they are in every school. They just have a different focus. Dianna French-Bower my point is we do not need to be closing schools, we do not need 2-4 boards of education that segregate students by religion and language, and the existing high school structure and curriculum in Ontario needs a major restructuring. In fact, I would bring OAC back and perhaps add a year. Most students are not ready for post-secondary education in Ontario. And when we talk about neighbourhoods, I’m referring to the future of neighbourhoods because families don’t move to neighbourhoods where there are not schools – and busing is yet another way of adding to the lack of physical exercise among young people. There is a lack of arts, music and physical education in so many schools. I have very little support to offer our boards, which operate in a vacuum. If we had enough students, I’d agree with you based on what we have now. I think having 2 school boards is enough based on language. Students already have the right to stay in school until the year in which they turn 21. While other boards may charge for the extra time in school, the HDSB doesn’t. For those students who are ready, they can move on and for those that aren’t, let them take another year or two. This has been further compounded by the lack of choice in Burlington due to the empty pupil places and the lack of money the board actually has to work with. If you look at the pie chart or the budget documents, you will see very little wiggle room. The money is enveloped and has to be spent in specific areas. In terms of neighbourhoods, well we moved into ours because we liked the house. With four kids; 3 with disabilities, 2 still in high school, I guess we are thankful that our children are getting an education. Ironic enough, I have one that walks the 3 kms to the same school that the other one gets bused to. Different disabilities, different needs. My kids have always gone to where the programming is rather than the nearest school. At one point we had four kids in four different schools. We do what we have to to ensure our children receive a good education which is why I believe in choice of programming and choice in delivery rather than missing out on programming and having to take a class a specific way even if you can’t learn that way. In terms of exercise, I don’t look to the school and getting to and from school as much as I look to what they do when they get home. If my kids are outside with their friends after school and playing basketball or going bike riding and doing outdoor activities rather than always doing video games, then the proximity of the school to home becomes a moot point. Dianna French-Bower Some very good points. I think another problem with education funding was taking it away completely from the local boards. Every city has different issues and needs and like you said, some are simply underfunded regardless of the student population. But so far, no political party has had the drive to address the issue of amalgamating boards as so many other provinces have done. Very sad. You might want to check out OPSBA, the Ontario Public School Boards Association (public) and see if they have anything on the issue of one school board. I believe it is the separate board that is holding back. It would certainly change not only programming but the number of students in any one area. Thing is parents put their kids in a bubble. I was walking to and from school in grade 4. Now kids barely walk to and from school. Or their parents don’t trust them to hang out after school. Which I find funny parents know more where their kids are now with cell phones. Than I did we just came home when the streets lights come on, or you heard your mom yelling your name for dinner. I can’t remember the last time I saw a hockey game on a street of kids… right because it’s a by law and if someone calls in you can get a fine. Yes I walked to school too growing up in Hamilton. And that included winter storms and blizzards – which we loved. I walked home at lunch in grad school, then walked back to school. We all did. The only time I took a bus was when I moved up on the Mountain and had to take the HSR out to Westdale Secondary. But that too was a cool experience. Sometimes i rode my 10-speed to school up and down the Queen Street access. I’m a lot younger I’m only 27 but we had the same rules because their wasn’t sticking us in bubbles. Find now parents are now push overs on a lot of things. There isn’t fearing your parents or respect which is horrible. The misdirection was the responsibility of the Board. This has been a constant strategy of the Board to direct the PAR where they want it to go. They are the ones that couched the enrollment data in terms of the OTG. All the other metrics were “too much work” or “too complicated” to provide. I didn’t see anything else in the LTAPs or other reports, comprising the majority of resources available to me. The costs you describe varied all over the place and were never assured by the Board as correct. Indeed, it was the opposite, as this, and pretty much all the data provided was questionable or outright called inaccurate or not valid by the Board. It really is a ridiculous situation, but the Board just marches on toward their objective based on information they choose – this is the misdirection you cite. You say you regret that the numbers were the focus and not the students. I had that complaint too. Tell us in detail and data how the students are suffering now, and how closing schools will fix this. I asked for this accounting in real data officially a couple of times, but got zero reply. You talk about these things abstractly, in some detail about some things, but you never quantify the current deficiencies, what’s missing, where, in how much; or quantify how this would be fixed by closing schools. You don’t provide an argument to show how all the programs you cite should be in every school, or even could be. We need a much more cogent demonstration of analysis of facts and data to show your points. 1. I have asked the Director and Board several times for factual data on how HDSB students are suffering from inadequate programming and access. And accompanying that request, I asked for detailed data on how the money saved from school closures would be used to provide a net increase in additional programming and access, in what amounts, at what schools, for how many students, and so on. I want a full accounting of the costs, savings, and benefits to students. I also want data to compare costs and benefits on how additional busing of students would impact those students in terms of opportunities and access to other programs – athletics, clubs, and the like – with the claimed programming increases. This information was not even attempted to be answered. You only provide the same generic and abstract descriptions of this offered reason for the PAR. I am asking for quantitative estimates as proof. If as you say, only Burlington is short programs, it shouldn’t be a problem to identify this information. The 1800 empty seats you talk about have been described by me as having been mostly built by the Board, with the foreknowledge that this produced surplus seats that would eventually become a serious and certain crisis for the other 6 Burlington schools. You know this, but do not demand answers and accountability. And please don’t tell me that it’s done and too bad, we have to deal with it. It’s impossible to trust the Board having done this, and then evading it, hoping people like you will let them off. 2. A Boundary Review is a general option in the PAR (e.g. Option 7b). You know the building of Hayden, based only on a boundary review, and no PAR, when it was known at the time that the majority of the current surplus seats were in the enrollment projections, and would be a serious result for the 6 schools in the future. There is written official evidence that the Board made a deal with the Ministry to fund Hayden despite the known resultant empty seats, but with a Trustee resolution that some of the cost of Hayden would be paid for by disposition of surplus assets sometime in the future. Hayden may be paid for cash-wise, as Board staff have stated, but the deal made with the Ministry is still a policy based agreement, and without a corresponding written agreement cancelling this deal, is still binding. At PARC meetings, Board staff and Trustees have initially this denied this deal, or discounted it out of hand with misinformation or denied they knew anything because they were not there or were peripheral, at the time. We have heard nothing of any kind of forthcoming, honest explanation, and this has been outrageous and infuriating. That time to live up to the deal is now. You seem to be denying that a boundary review (the basis of option 7b) is sufficient at present, as it was you claim for Hayden at the time. You are saying that for Hayden, despite knowing a surplus seats condition for all of Burlington was being built, a PAR was not appropriate, or needed. This makes no sense, and just sounds like you are pretending it didn’t happen and is of no consequence for you or the Board. I have also asked for the justification paper trail for Hayden, but have been denied this information and have had to ask Freedom of Information for this. All I have seen stated by the Board is evasion of the issue, and a refusal to discuss it in a flight from transparency – truth – and accountability. As a PARC member, you have received all of my official messages to the PAR, so you have seen the details of my argument. Yet, you too just talk and act like none of it was ever communicated to you. So your posture is that of the Board – just ignore what you don’t want to hear because you can. Stick to your choice of narrative pushing what you want. 3. 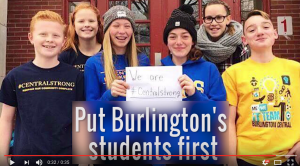 Burlington can get the money from the Board by sharing. It’s our money and our schools. Burlington’s share of the costs and enrollment is small at about 3 to 4 %, so It is easy (or should be with will and a try) to develop a plan over a suitable time to share the burden of impossible aspirations for every possible program or course in every school. But the Board doesn’t seem to want to do that to show residents what it would involve. In Halton’s context not onerous I say. The only calculations they seem to want to do are those that close schools. You too. I prefer a no schools close option with bussing students to schools with lower enrolment if necessary. Our neighbourhoods are in the midst of much change with demographics. Why do we need to consider closing now? This is premature and unnecessary. My concern with the rush on closing schools especially Central is how many developers are waiting in the wings to erect more concrete towers. What is the rush? From the number of signs I have seen all over downtown, it is obvious to me and hopefully the people in charge that this is not what they want. It’s not clear why you would make a comment about the data being incorrect (and I agree it absolutely IS inaccurate) then compile an entire spreadsheet using that inaccurate data to make your points about which schools should close. There are several completely false numbers here on Bateman and they should be changed. You make no contribution here to inform readers. All you do is speak confusion. You must have a motive. All you say is that there are inaccurate data, and call them completely false, but don’t tell us what they are. It is your responsibility to back up such extreme claims. Then you say that these completely false numbers should be changed, but again don’t tell us what they should be changed to, and what completely accurate data set should be used instead. So logically, what you are really saying is that some data, unspecified, that you claim are false, should be changed to other data, also unspecified, presumably from a data set, also unspecified. I say that it’s you, not Marianne, that is trying to make a comment about data being incorrect, then compiling remarks that are based on an imagined spreadsheet, containing nothing at all, to make your point. You tried but failed, and added or explained nothing, accurate, false, inaccurate, or otherwise. Why you did this is completely unclear, although I can surmise. Denise, The data is a consolidation of the information in the School Information Profiles and other information provided to the Program & Accommodation Review Committee, all available online. It is important for the community to have this information precisely so they can review and analyse. A “no schools close option” was one of five the PARC recommended, and is widely supported in the community a a whole. An excellent report on the various ways schools can be measured for true effectiveness (or not). In the end, schools should be located so that they can serve the greatest number of students who can walk to them. Bussing within the urban boundaries is not a solution, it is a problem. Portables are not solutions, they are problems. The province, through its flawed PAR process and a funding formula that favours building large new schools (requiring bussing) while underfunding existing schools, needs to step up and halt all PAR’s in Ontario until it fixes both issues. In the meantime, the Trustees need to show courage and vote NO CLOSURES. Thank you so much for your excellent report on school closures. I had read (and voted on) the options as presented on the HDSB website, but your article is much clearer and more helpful. I am not a parent or grandparent, but these proposed closures affect everyone in every community. I hope our voices will be heard and wisdom will prevail. Thank you as well for your involvement in the campaign to keep schools open. A great job of bringing this information to general public attention and to mine, as the Board didn’t do it, just to the PARC, and from what I’ve heard, then just left it to them to figure out. This is so clear and fact-based that I need say nothing, but I have two things I would like to. 1. As I recall, the number of students impacted by moving them, and perhaps increasing busing, when Hayden was opened, was about 900, who were held at other schools, who then lost them. This is about the same number of students that will be impacted when the Hayden boundaries are changed under the no-closures option 7b. Given all your discussion of the criteria used to judge options, and other matters, this is what should have been considered in the first place, as it was known beforehand that this is what would happen. 2. I appreciate your data on busing eligibility by school. Hayden is the lowest eligible, and no closures only increases busing by 131, presumably most at Hayden. Whereas, closures increase busing by 300 to 615. Given Hayden was built, it is said, to reduce busing, closing schools does the opposite. Add the rest of your excellent article and NO CLOSURES is the only sensible and the best option. A one school system would be a start. they’re all bad choices and the boards of education here, Hamilton and across the province have done a disservice to their communities – closing schools, destroying communities and neighbourhoods, and not having the “balls” to stand up to the “still hanging on” Mike Harris formula for school funding. Pathetic. They should all be thrown out. Private schools are on the forefront. No disruptions. Yes, thank you Marianne for the report, very well done and a great summary. It just makes sense not to close any of the schools. short term gain long term pain. Trudeau announces educating people is a top priority but where are you going to do it if you close schools. Clearly small brained people are making these choices. Where is our Mayor and other councillors. It is just not a ward 2 issuse. Thank you Marianne for fighting for our children . The province oversees funding for education so it’s Wynne and Education Minister Mitzi Hunter people should be emailing and writing. Look at where Wynne is taking us…. Some troubling data here, for example, Bateman is the only school in the city in full compliance with the AODA, yet these numbers show it’s facing the highest costs. The costs for AODA are the lowest for Bateman and the highest for Central. In terms of renewal costs they cannot be compared between schools because it is what is needed to bring the individual schools up to their original standard. Considering the specialized programs and infrastructure required to support the high need special education students in the self contained placement…the costs for Bateman will of course be higher. This is why you can’t compare renewal costs from school to school. The problem is again about misinformation – that’s not what is stated on Meed Ward’s website. I was told some time ago I was naive to think that no schools could close. Given this entire process, the unreliable data, etc- I’d say let’s put the reigns on now before we do something any of us that care about the community will regret. If there was crystal clear rationale for closures, I would reluctantly understand. Not so in 2017. I continue to vote to close no schools! Actually there are valid reasons. Student choice of programming and student choice of how to access it. Students are having to take mandatory courses online because there aren’t enough sections to schools to offer them any other way. For the student who can’t learn online it affects their future. Should every other area in Halton be able to provide this challenge and choice to their students while Burlington students don’t have it? which they should have done before building Hayden, put that money into these schools they are trying to close. I’m hoping for no schools to be closed. You stop putting time and money into schools to keep them open or running order. They are going to fall down around you, or as the boards eyes “not fit”. Also what about the teachers and EA’s whom which will loose their teaching spots. The ones close to retirement or have some good teaching left in them with be forced out and the new teachers may get spots close to where they were teaching. I just think it’s funny that small schools lower than high way 5 are on the chopping block for a board mistake on building Hayden. We were sold a bill of goods with Hayden. Caught in a lie! In terms of Pearson “losing their students” it was reported at the boundary review for Hayden from the Pearson Reps that their students were suffering then before Hayden even opened. They reported that coming Grade 11 and 12 their students had to go to Notre Dame or MMR to get the courses they needed. Seeing as the rural students from Kilbride have no access to public transportation and they were bused to Pearson they were denied the same opportunities as the rest of Pearson students come Grades 11 and 12. This change for rural Burlington was supported by the Pearson Reps on the committee to ensure equity of access for the rural students. Wow. Thanks for the synopsis. The complexity of the situation is very clear. No School to close option!!! If this would solve the problem and provide equal access to programming and how to access same…sure. Then again…we would be looking at a Boundary Review rather than a PAR. The board is the lowest funded board in the province despite the amount of taxes that are paid. If you check out the pie chart at hdsb.ca you will see that most funding is enveloped and can only be spent there. There is a very small wedge for other things and certainly not enough to give to Burlington while taking away from all students in the Board. While this is a Burlington PAR, it is a board wide budget that supports students throughout Halton. Last year alone there were reductions in various areas including $2 million in special education and another $2 million for this year. Thank you for this report. So well-written and easy to understand! The problem here is that this synopsis compares data that can not be compared. It’s like apples to oranges. If no schools was a viable option we would be looking at a Boundary Review.